While officiating the Art & Design Exhibition at the Meragang Sixth Form Centre, Education Minister Pehin Dato Hj Abd Rahman said the new education system (SPN21), art was a subject that the ministry encouraged students to take. "Doing art doesn’t mean you’re going to be an artist. You could do art and develop some other skills. For example, if you’re good in drawing and Mathematics, you could become an architect." "This is the sort of thing we want to develop among our youths. Art is something that is not only creative but involves a lot of hard work, thinking and dreaming." The minister said that he wanted to develop the talent of the local artists and see them aspire to be on the same stage as their international counterparts. He added that the ministry was looking into the issue of the shortage of art teachers in the country. "It’s not something which is easy to tackle because (the teachers) themselves have to have dedication and passion for the subject, but we are developing local skills." Pehin Dato Hj Abdul Rahman also remarked on the introduction of a Fine Arts degree programme at Universiti Brunei Darussalam (UBD), stating that it provides an alternative option for students to study art in the country. 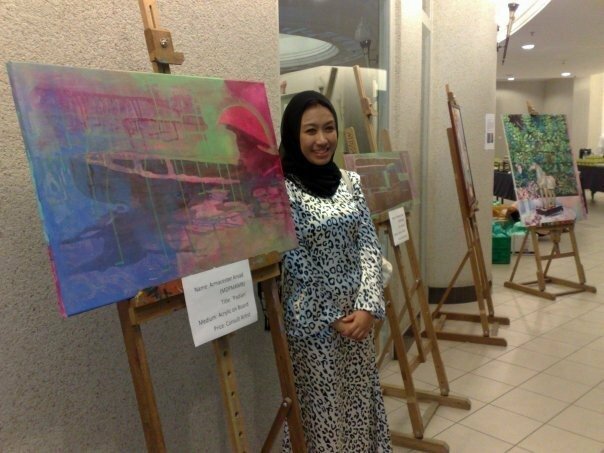 I was a student of Maktab Sains doing Science stream with Art as an extra subject, Ck Hjh Masna who is still teaching in Maktab Sains was my guiding force in the art subject for the whole of my 7 years in that college,she taught me well enough for me to proceed further in art. Went on to do a degree course under Government Scholarship, graduated with a BA(Hons) Fine Art from the University of Huddersfield, United Kingdom and now currently under in-service training doing MA Fine Arts at the Winchester School of Art, University of Southampton. Why did you choose UK, specifically Winchester? why winchester? i like the course content and structure of the course..i believed that it would make full use of my potential if not improve it even more..plus,it’s just an hour away from london thus the main art galleries are within reach..once i’m in WSA,i know i have made the best decision,i’m having a wonderful studying experience here..all of my tutors and staffs are amazing..my classes are all beneficial towards my betterment as an artist and also as an art teacher..
before this,i have been teaching art A-level for 6 years 🙂 and also practice my art on the side,exhibiting works in the uk,malaysia and brunei..
How is the art scene in UK? 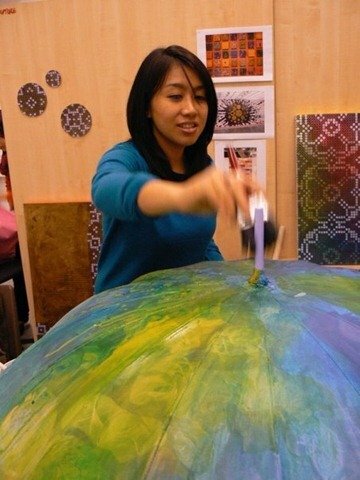 What do you think of the artistic talent in Brunei? 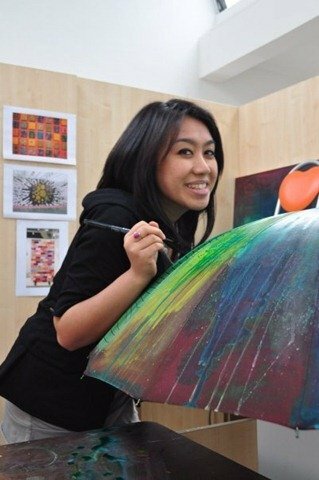 artistic talent in brunei is blossoming..i personally am proud of the G5 group,i love working with them and i’m planning to collaborate with them in the near future..same goes to the already well-established artists of brunei..brunei’s art scene comprises of 2 groups i believe,the already well-established ones (such as the likes of hj padzil, zakaria omar, pg roslan,pg kamarul,marsidi omar,hj dayang..that is just to name a few) and the new G5 artists..my ‘sifu’s/mentors are zakaria omar and pg roslan..they’re the ones who exposed me to the brunei art scene..i’m looking forward to do more exhibitions with them soon..
Art has always been "non-mainstream" subject in Brunei and not given much priority by both MOE and many parents do not see Art as a "career" subject. What are your thoughts on this? i think MOE is starting to alter that mindset abit..during my time it was just the 3 of us who went abroad but now i know the number of students being sent to uk to do art has increased..plus with SPN21,art stands tall with the rest of the subjects being taught in schools..it is well-thought through in terms of structure and content..in terms of career,i believe there are job opportunities..art teachers are still in need and that is a fact..but apart from the education side,there are other opportunities too..one can be designers, one can do videos, animation and contribute to the betterment of our rtb, one can design fabrics/textiles..and the list just goes on..i guess people just need to be educated more on how massive the art area is, and that art is not simply just drawing and painting a beautiful picture..